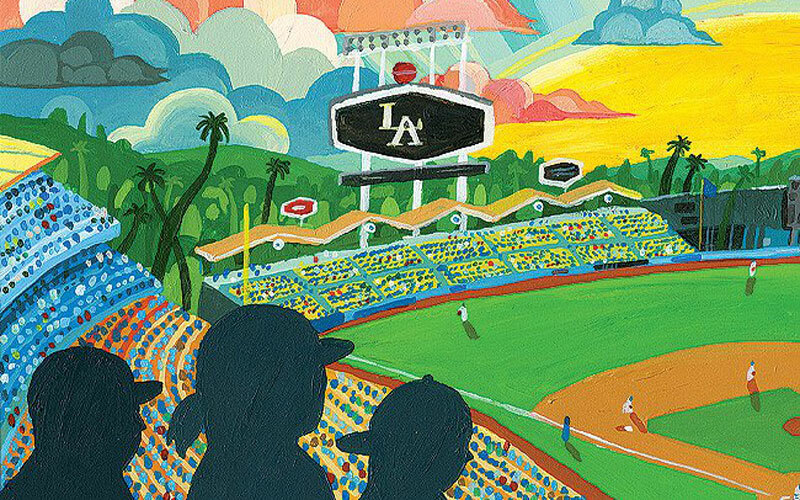 Today, April 3, 2017, marks the opening day of the Dodgers’ baseball season—the first season in over half a century that won’t be called by Vin Scully. In 2013, we asked the legendary announcer to describe what, exactly, is so magical about America’s pastime. I’m from New York. I’m from growing up and looking out an apartment window and you either saw another apartment window or a clothesline. Here I can walk outside and see a tree and have my coffee, and I can walk barefoot and feel the grass beneath my feet. These are moments to treasure, especially when, as with me, it’s not where you’re from. We’d take the subway and go out to Jones Beach, but it was a forever trek so we only went to the beach a couple of times a year. Most of the time we went to Tar Beach. Tar Beach is the roof of the apartment house. You’d sit up there and roast, and that was your summer. When we had the house in Pacific Palisades, we were members of the Beach Club. The only problem is the sun is my undoing—being a redhead—but I spent a lot of time there anyway. Right near our home was Rustic Canyon Park, and we would go down and play softball. Our kids were never sick. They played outdoors until the last minute. I really think that helped them. We never went away for the summer because that was when I was working. Of course the climate here is wonderful. I broke into this business in Washington, D.C., which is very humid. I was traveling a lot to cities like Cincinnati and St. Louis, where the humidity was also fierce. It was strength sapping. I remember Stan Musial saying, “Boy, if I’d played in L.A., I would have lasted another ten years.” You’re not exhausted by the weather. You go east and you get hammered. The first few years I was here, the Mets were not in existence. It’s 1958, ’59, ’60, ’61, and we’d go to Philadelphia, and I would take the train to New York to visit family and friends. They would say, How do you like it? I would say, It’s really nice, and they would say, It’s got smog and earthquakes and so on. The first few times I would argue and say, No, it’s not that bad. By the fourth year they would start up and I’d say, You’re right, and tell your friends to stay right here. And that’s when I knew I was an Angeleno. As God is my judge. I keep in my notebook something the former commissioner of baseball, Bart Giamatti—who was at one time the president of Yale and an extremely literate, wonderful man—wrote about the season: “It is designed to break your heart. The game begins in the spring, when everything else begins again, and it blossoms in the summer, filling the afternoons and evenings….You count on it, rely on it, to buffer the passage of time, to keep the memory of sunshine and high skies alive. And then, just when the days are all twilight, when you need it most, it stops. Today, October 2, a Sunday of rain and broken branches and leaf-clogged drains and slick streets, it stopped, and summer was gone.” Isn’t that something? That’s as good as it gets.